Cheap and cheerful earbuds with a detachable mic. No, they don’t offer world-class audio, but they’re a perfect budget option for mobile gaming. It was only a matter of time before Turtle Beach, one of the biggest names in gaming headsets, produced a pair of gaming earbuds. The Battle Buds are designed for mobile and Switch players looking for something ultra-portable and respectably low-priced. These aren’t your primo audio device for long gaming sessions at home, but a convenient option for on-the-go gaming, especially given they retail for $30 / £25. And in this specific context, the Battle Buds perform pretty well. What you’re getting is, essentially, a pair of earbuds on the end of a 1m wire, which plugs into your device of choice via a 3.5mm audio jack. There’s no wireless functionality here, so they won’t work with newer iPhones that have ditched the 3.5mm socket (unless you buy an adaptor), but they’re perfect for all sensibly built mobiles and, of course, they're a good Nintendo Switch headset. If you want to use them at home they will slot into PS4’s DualShock 4 or a compatible Xbox One controller, and will work just fine. There’s a control box along the left-hand wire which has a basic volume control, a mic mute, and a Google assistant button on the back. For me, the volume control should be on the main section of the wire, as it’s way too close to the earbud to use effectively. Plus, it’s too easy to hit the Google assistant button on the back, while you’re adjusting volume, which can completely ruin a game of Fortnite mobile if you’re taken away from the app you’re using. Finally, a note on the earbuds themselves. The 10mm drivers are housed inside rather large, triangular plastic cases (a bit like those Quality Street sweets that no-one ever eats) that do stick out quite far from your head. While the Battle Buds come with different sized rubber fittings to suit the size of your earholes (hopefully), the weight of the plastic does mean they never feel snug or totally secure, so you’ll find - especially if you hook up the detachable mic - that they sag a little. To their credit, though, the Buds never dropped out, no matter how hard I shook my head, thanks to ear-grips in between the plastic outer shell and the rubber inner buds. While testing I managed about 30 minutes of wear before needing a break from the Buds, which is just fine if not quite on the level of Apple’s own wireless earpods, for example (which cost a hell of a lot more). This provided an early indication that they may well be ideal for a commute. While the design of the Battle Buds is lacking, the audio performance is, on the whole, good. I tested the buds on mobile (using an Honor View20 and a Samsung Galaxy S9), on Switch, and on a PS4 Pro via the DualShock. 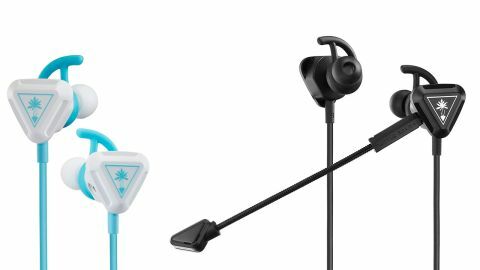 It’s clear that mobile is the place these earbuds excel, and they were well up to the task of something like Fortnite. Alert pings were clear, gunfire distinct, and all audio within the game was pleasingly clear. You’re obviously not going to get surround sound or effective spatial audio, but the Battle Buds were clear and precise. The mic was fine at presenting the limited voice chat available, which is what you’d expect from a budget detachable. Shifting to Life is Strange mobile, the music within the game was nice and clear, and it mixed well with sound effects and dialogue. There’s little sense of immersion, and the Buds struggle a bit with heavy bass, but for such a cheap audio device, you can cut it some slack and it performed remarkably well. Turning to Switch, the Battle Buds made a commendable attempt at Mario Kart 8. They picked up all the chaotic sounds of the race and, while unable to present a handful of incidental sounds that more expensive headsets reveal, they gave enough for me to feel like I’d been fully present and immersed in the races I played. Music, again, was especially clear. Heading into Assassin’s Creed Odyssey on PS4 Pro, the Battle Buds really suffered, particularly when compared to traditional gaming headsets. They fail to pick up much of the ambient noise in Ancient Greece, but do a great job in making the character dialogue feel balanced among the sounds of war, stabbing, and the swelling orchestral soundtrack. While performance here is fine, there’s nothing to suggest the Battle Buds deliver audio to rival that of your TV speakers, so unless you really need to be using a headset it’s not worth slotting them into your ears while on the sofa. Music and TV? Yes, they perform fine, especially if you’re catching up on Santa Clarita Diet during your work commute (which you absolutely should be). Again, bass really suffers with music, so be aware of this if you’re listening to anything with a heavy bassline. Overall - should you buy them? Tricky question. For mobile gaming they’re a wonderfully affordable, very portable option - and it’s here that they’re most at home. At $30 / £25 they represent excellent value and are almost the kind of buds you wouldn’t mind using hard and discarding after a few months, or just keeping for holidays and long journeys. But for anything else, Switch included, we’d recommend spending another 20-25 of your chosen currency and picking up a decent budget headset like the Turtle Beach Recon 70, or the HyperX Cloud Stringer, both of which can be found for less than $50 / £40. The Battle Buds are plucky little earphones, and more portable than any of their rivals, so if you absolutely must have buds instead of a full headset, these should be your first choice despite some questionable aesthetics and weaker sound capabilities.